Every now and then, a piece of architecture lends itself to being used in a way that’s completely different than its intended purpose. In New York City, one needn’t look any further than the High Line. Located along the western edge of Manhattan, the former elevated train track is now a popular public park that has attracted millions of visitors since it opened in 2009. But this weekend the park will be ready for its second act when it’s transformed into a stage for a monumental—and free—opera. 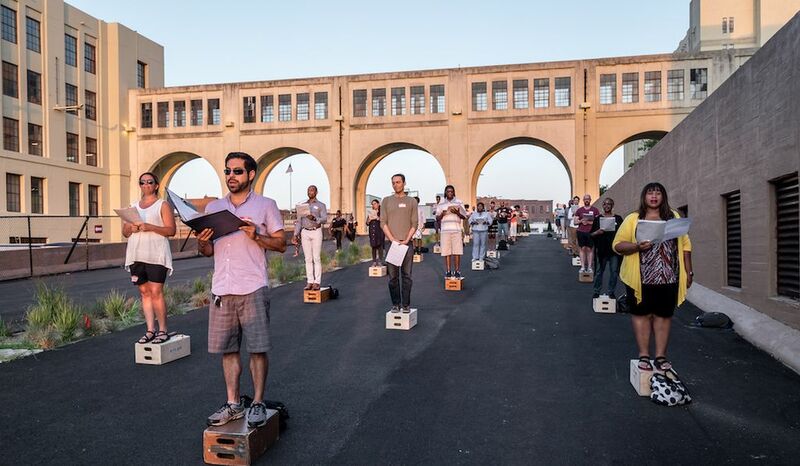 Called the “Mile-Long Opera, a biography of 7 o’clock,” the immersive event takes place over the course of six consecutive nights, which started October 3 and will run through October 8, and brings the personal stories of hundreds of New Yorkers to life through song. Some 1,000 professional and avocational vocalists representing the city’s five boroughs have been tapped to share stories of this rapidly evolving city – all of which revolve around one common theme: What does 7 o’clock in the evening mean to you? Putting together such an ambitious project didn’t happen overnight. In fact, it took about six years for Elizabeth Diller, an architect and partner at Diller Scofidio + Renfro, a multidisciplinary design studio based in NYC, and her team to bring their audacious idea from dream to reality. Perhaps no one is more familiar with the High Line than Diller. She’s one of the architects responsible for designing the park and even years ago knew it had potential to someday serve as a musical venue. Not to mention the chorus of sounds that define the city, from the rumbling engines of garbage trucks creeping along the streets on trash day to the deafening wail of police sirens as they reverberate off of building facades. To create the opera, Diller and her team got the blessing of Friends of the High Line before reaching out to Pulitzer Prize-winning composer and fellow New Yorker David Lang, as well as Brooklyn-based creative studio PEOPLMOVR, which descended onto the streets of NYC to interview residents and gather their individual stories about 7 o’clock. Poet Anne Carson and poet/essayist Claudia Rankine took inspiration from these micro-stories and weaved them together to create a cohesive piece of vocal art that would coalesce as listeners stroll along the High Line’s pathways. And while New Yorkers’ stories largely informed the composition of the opera, Diller says so did the High Line itself. But perhaps one of the most important things for Diller and her team was to take a giant step towards democratizing the opera and making it something approachable to people in all walks of life. They did so by taking a subject that everyone relates to and experiences each day of their lives. In this case, 7 p.m. The “Mile-Long Opera, a biography of 7 o’clock” takes place each evening at 7 p.m. and runs from through 8. While ticket registration is currently at capacity, a waitlist is available and can be found here.